For whatever reason, the previews for this movie didn't create much of a desire to see it. But it's not like Pixar has every made anything actually bad. Even their lesser films, such as Monsters or Cars have some redeeming entertainment. Names matter, whether it be a book, a TV series, a magazine, a movie, etc. 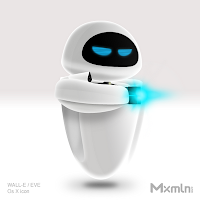 Wall-E says little to invite much attention. On the other hand, had I known that Wall-E was an acronym for "Waste Allocation Load-Lifter - Earth Class," most probably would not consider it a positive revelation from a marketing standpoint. Eh, what do I know? 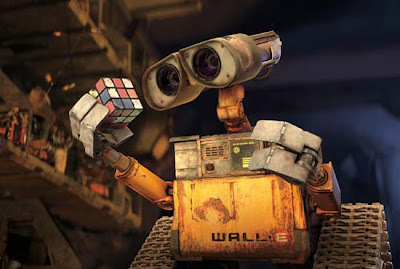 Wall-E is probably the most imaginative and enjoyable movie I've seen in years. It has elements that I like... robots, science-fiction, futurism, cutting wit, thought provoking subject matter... and did I mention Robots!? One even has a cool blaster (also designed with the efficiency of an I-pod). I'll leave it to the "New York Times" to get into a very well considered review of the movie. 1) Great imagination (thus amusement) throughout. 2) The human traits of overcoming obstacles and aspiring to greater things. 3) The need for relationships to experience life meaningfully. If you haven't seen the movie, I can't recommend one more highly! I bought this movie for the nephews, but hadn't watched it yet. I too have seen previews that didn't make it seem like that great of a movie. After all, no big name stars as voices, just a dumpy little robot zooming around. But after your review, I may have to go ahead and crack open the wrapper and actually put it in.